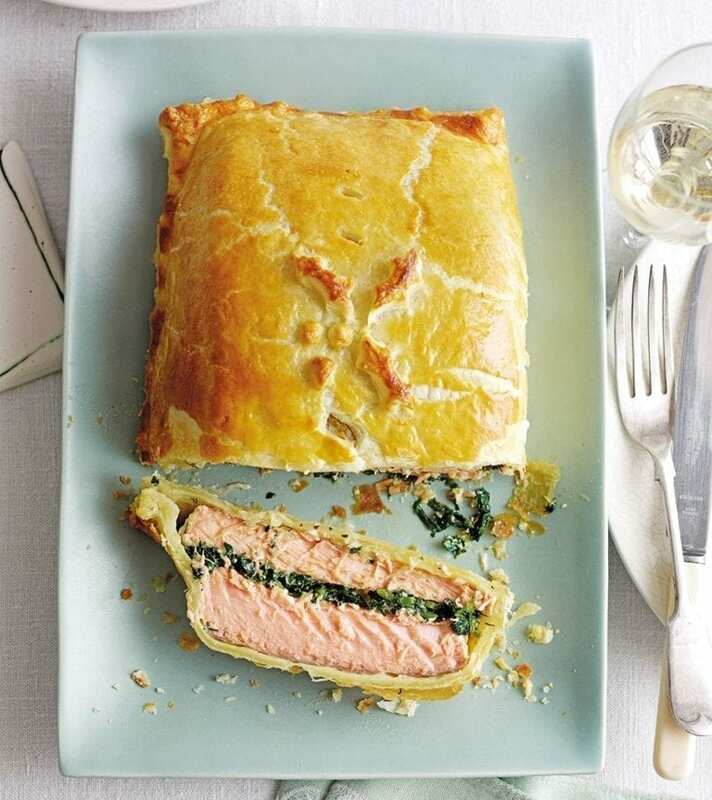 Our straightforward recipe makes light work of the tricky salmon en croûte. Serve this French classic as the centre piece at special gatherings with family and friends. Or, for something equally as impressive, why not try our one-pan whole roast salmon. Heat the butter in a large frying pan over a high heat. Add the garlic and, when it releases its aroma, tip in the spinach and watercress. Stir until the leaves just wilt. Tip into a sieve and press down firmly on the wilted leaves with the back of a wooden spoon to squeeze out as much moisture as you can. Roughly chop, discarding any tough stems, then put in a mixing bowl with the dill and lemon zest. Stir well. Season with salt and pepper. Dry the salmon fillets thoroughly on kitchen paper and season them generously. Lay the fillets on a chopping board, skinned-side down, and run your finger down each to check for pin bones. If you find any, pull them out with tweezers. Stir the horseradish into the crème fraîche, then spread evenly over one of the fillets, followed by the spinach mixture. Top with the other fillet, skinned-side up (see tips). Roll out the pastry on a floured surface to a 3mm thickness and trim to a 27cm x 40cm rectangle (or big enough to leave a generous border around the salmon when folded over). Put on a lined baking sheet and brush with the Dijon mustard. With a short pastry edge facing you, put the stacked salmon fillets across the top half of the pastry, leaving a 2-3cm border. Brush the pastry edges with some of the beaten egg, then fold the bottom half over to cover the fish. Trim the edges, crimp them by pinching gently to seal (see tips), then brush with a little more beaten egg. Top with decorations made from the pastry trimmings, then brush again with beaten egg. Chill for at least 20 minutes (see Make Ahead). Heat the oven to 200°C/fan180°C/gas 6. Once chilled, make a few small holes in the top of the pastry for the steam to escape, brush with the remaining beaten egg and bake for 25-30 minutes until puffed and golden and a few juices leach out of the holes. Rest for a few minutes before slicing, or leave to cool a little and serve warm. Most puff pastry blocks come in 500g packs. To use the leftover trimmings for more than decoration, make quick cheese straws: slice neatly into strips after rolling – without crumpling – brush with beaten egg, sprinkle with grated parmesan and bake for 10-12 minutes in a 200°C/fan180°C/gas 6 oven. Assemble the dish up to 24 hours in advance and keep, covered with cling film, in the fridge. Bake from chilled. Freeze the unbaked salmon for up to 1 month. Bake straight from frozen, adding an extra 30 minutes to the oven time. Cover with foil if the pastry turns too dark. Nothing beats a buttery white burgundy with this – a mâcon-villages is good value, or splash out on a white meursault.